Dan Baker helped propel Ospreys to a 26-15 victory over the Blues on Sunday afternoon with an explosive display from No 8. Here, we analyse his powerful attacking performance. September and October are two vital months for budding internationals on these shores. With encounters against southern hemisphere opposition on the horizon, it is a pivotal time to perform. Beginning with domestic action and ending in a European crescendo, the period provides a perfect platform to impress Test credentials. Starting and starring in five of Ospreys’ six straight wins, Dan Baker cannot have nudged Warren Gatland harder. 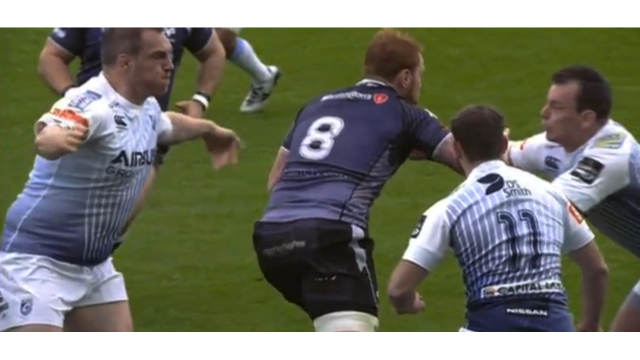 Clearly inspired by the experience of two June tours, first to Japan last year and then to South Africa this summer, the red-haired No 8 is intent on a central role in Wales’ plans. As an attacking weapon, he looks devastating – often instigating go-forward out of nowhere. Though the burly 22 year-old remains slightly raw and is yet to register an full-match shift this campaign, his numbers stack up very well. In 304 minutes, there have been 47 carries. Baker has broken 11 tackles on the way to five clean breaks, executing seven offloads on the way. Incumbent Taulupe Faletau is a supreme, once-in-a-generation talent. Still, why not accommodate him and Baker in the same side? Either could be deployed as a blindside flanker. Add in Sam Warburton and Justin Tipuric and you have four exceptional back-rowers that cover all bases across a match-day 23, and that’s omitting Dan Lydiate, a Gatland favourite. Regardless of such debate, Baker was impossible to ignore as Ospreys dismantled the Cardiff Blues on Sunday in a 26-15 victory that was actually far more dominant than an 11-point margin suggests. From the very outset at the Liberty Stadium, he carved into the visitors. These clips demonstrate the carnage Baker caused. First, watch this run from the opening kick-off. In terms of setting the tone – something every coach at every level of rugby will highlight just about every outing – this was seismic. 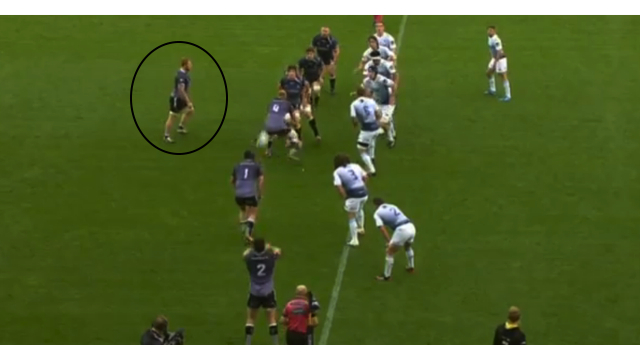 Signalling a great work-ethic and nous, Baker recovers his feet in time to hit the next ruck, honing in onto the jackal of Warburton (blue circle). 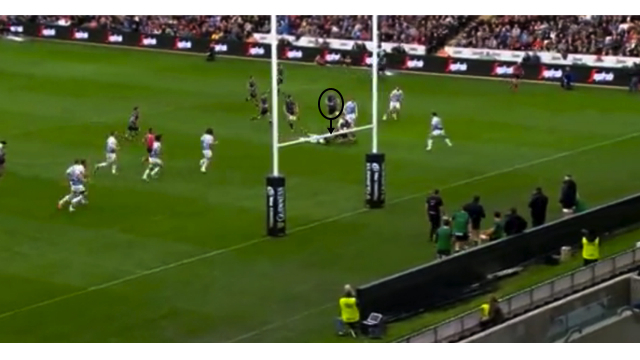 This helps accentuate Warburton’s influence at the breakdown and compelled referee Leighton Hodges to penalise the Wales captain for not releasing the tackled player prior to competing for the ball. 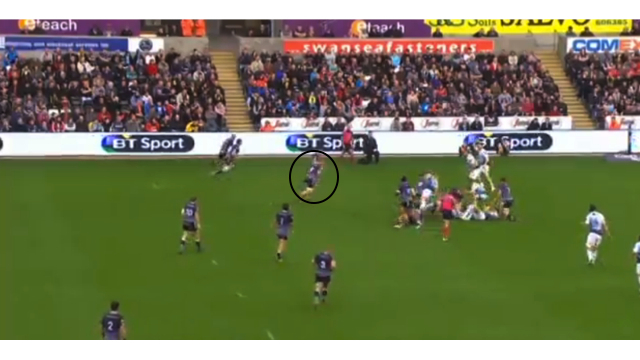 After Dan Biggar‘s kick, Ospreys were 9-0 ahead and cruising. Around four or five metres behind his scrum-half, Baker is offering depth and pace – two ingredients to make any carrier tougher to nullify. This, as well as the sheer industry to take the ball on from the next phase as well, show Baker is not merely a merchant of blockbuster, barnstorming plays. He is well versed in subtleties too. This angle is a good one to expose Baker’s contribution. He unselfishly mirrors Matavesi’s angle to hit the ruck and secure possession, which his teammates duly turned into points. As the No 8 underlined later, he is just as happy to assume the role of facilitator. A gain of 40 metres justifies from a sweeping counter vindicates Baker’s unfussy decision-making. Indeed, he posed problems without the ball more than once. 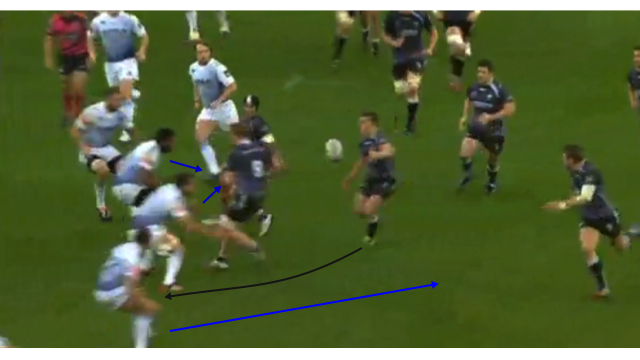 Pausing at the moment Matavesi frees Jeff Hassler with a short pass behind Baker, we see both Warburton and Manoa Vosowai are fixed, while Cory Allen has drifted wider onto the looping Biggar. 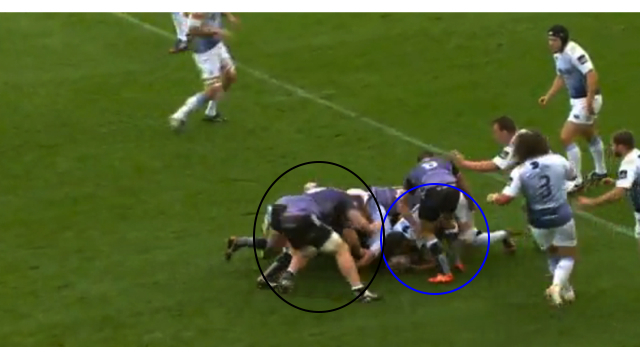 A gaping hole has been manipulated, defining a day in which the Ospreys No 8 could do very little wrong. Treviso and Northampton Saints are up next for Steve Tandy’s side in the European Champions Cup. Two influential outings should be sufficient to see Baker face Australia on November 8. He is a rough diamond, but this is no gamble. Even if the Wallabies fixture feels like a must-win, Gatland cannot die wondering. Read a feature-length interview with Ospreys fly-half Dan Biggar in this month’s Rugby World. Download the digital edition here or subscribe online.